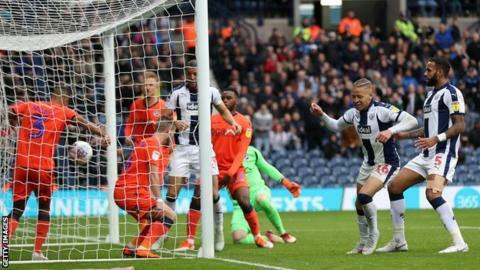 West Bromwich Albion recorded their fourth straight home win in the Championship by overcoming stubborn Millwall at the Hawthorns. Dwight Gayle's poacher's instinct came to the fore as he poked home a fifth goal of the season from close range. The on-loan Newcastle forward pounced in the penalty area after Millwall goalkeeper Ben Amos had produced a stunning save to tip Ahmed Hegazi's header against the crossbar. Millwall are now without a victory in six Championship games after Kieran Gibbs completed the win for the hosts, firing home from an acute angle at the back post after latching on to Tyrone Mears' curling cross. Jed Wallace almost gave the Lions a half-time lead with an ambitious 35-yard shot following a wayward kick from West Brom stopper Sam Johnstone but defender Craig Dawson rushed back to save his keeper's blushes, heading clear from the goal-line. Matt Phillips drilled a low shot narrowly wide straight after the restart but hobbled off with an injury soon after, although the hosts shook off the blow to run out worthy winners. The Baggies are the top scorers in the Championship with 22 goals, but plucky Millwall looked to have thwarted their opponents, only to be undone in a devastating eight-minute spell. Albion are now third in the Championship, just one point behind the top two, Leeds and Middlesbrough, who both failed to win on Saturday - while the Lions' loss saw them drop into the relegation places. "I thought it was a tough game all round. Millwall were very strong and I thought we found a way to beat a very strong and resolute rearguard. "We kept probing and we kept asking questions and we found the goal to break the deadlock. "The clean sheet was the icing on the cake in terms of three valuable points." "First and foremost of course I am disappointed with the result. "But when we are so good as we were at times in the first-half we have to be clinical and we had three good chances to score. "At the other end when things aren't going for you, it really kicks you. I am pleased with the players today because against QPR the other night we were not good enough in the first half." Match ends, West Bromwich Albion 2, Millwall 0. Second Half ends, West Bromwich Albion 2, Millwall 0. Substitution, West Bromwich Albion. Tosin Adarabioyo replaces Dwight Gayle. Delay in match Tyrone Mears (West Bromwich Albion) because of an injury. Attempt missed. Aiden O'Brien (Millwall) right footed shot from outside the box is close, but misses to the right. Assisted by Jed Wallace following a fast break. Substitution, West Bromwich Albion. Wes Hoolahan replaces Harvey Barnes. Goal! West Bromwich Albion 2, Millwall 0. Kieran Gibbs (West Bromwich Albion) left footed shot from the left side of the box to the bottom right corner. Substitution, Millwall. Lee Gregory replaces Tom Bradshaw. Substitution, Millwall. Aiden O'Brien replaces Jiri Skalak. Attempt missed. Chris Brunt (West Bromwich Albion) left footed shot from outside the box is too high. Assisted by Craig Dawson. Attempt blocked. Kyle Bartley (West Bromwich Albion) right footed shot from outside the box is blocked. Assisted by Chris Brunt. Attempt blocked. Harvey Barnes (West Bromwich Albion) left footed shot from outside the box is blocked. Assisted by Tyrone Mears. Goal! West Bromwich Albion 1, Millwall 0. Dwight Gayle (West Bromwich Albion) right footed shot from very close range to the bottom left corner following a corner. Attempt saved. Ahmed Hegazi (West Bromwich Albion) header from the centre of the box is saved in the top centre of the goal. Assisted by Chris Brunt with a cross. Corner, West Bromwich Albion. Conceded by Jake Cooper. Substitution, West Bromwich Albion. Tyrone Mears replaces Matt Phillips. Attempt missed. Kieran Gibbs (West Bromwich Albion) right footed shot from the centre of the box is high and wide to the right. Attempt blocked. Dwight Gayle (West Bromwich Albion) header from the centre of the box is blocked. Assisted by Matt Phillips with a cross. Attempt missed. Jed Wallace (Millwall) right footed shot from outside the box is too high following a set piece situation. Delay in match Kyle Bartley (West Bromwich Albion) because of an injury.